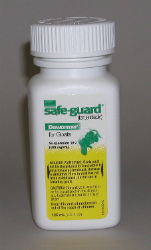 10% Fenbendazole Wormer for removal and control of stomach worms in goats. Give 2.3ml orally for each 100 lb body weight. 6 day slaughter withdrawal. DO NOT use in lactating goats.